When Mattie Markham and her family move from North Carolina to Pennsylvania to be closer to Mattie's grandmother as she moves into assisted living, Mattie worries that she won't make new friends. She is grateful, therefore, to discover that living next door to her new apartment is a girl her age named Agnes. Agnes, who has an unnamed social disorder accompanied by anxiety, is definitely unusual, but her enthusiasm for life, and her way of making everything feel important and exciting are appealing to Mattie, and the two become close quickly. Unfortunately, though, when school starts up again after Christmas, Mattie discovers that in her new classroom, Agnes is considered the weird kid. Worried about jeopardizing her chances of friendship with her other classmates, Mattie begins to distance herself from Agnes, finding it difficult to reconcile the fun she has with Agnes at home with how strangely she behaves in class. 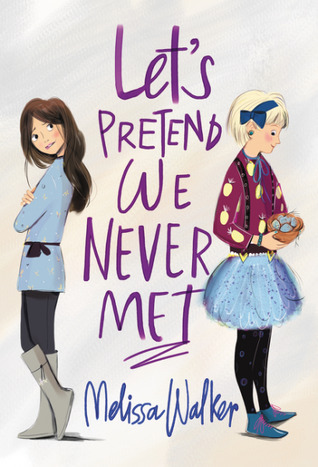 I chose to read Let's Pretend We Never Met solely based on the author, who is a fellow Vassar graduate and the author of the young adult novel, Unbreak My Heart, which I remembered praising in a review a few years ago. Once I learned what the book was about, there was a part of me that was afraid I'd just walked into a "Very Special Friendship" story a la Stargirl or Wonder, both of which I have found grating. I am so glad to be able to say that this book very clearly is not a message-driven story of the after school special variety, but a much more subtle character-driven novel about the difficulties of navigating fifth grade friendships. All of the characters, from Mattie and her parents, to Agnes and her mom, to Mattie's new teacher and classmates, are believable despite their relative lack of dysfunction. Though there are problems in the story - Mattie's mom's struggle to find full-time work, Mattie's grandmother's signs of dementia, and Agnes's parents' marital difficulties - they are the problems of ordinary life, and these difficulties inform each other to give a complete portrait of Mattie as a character and her friendship with Agnes. Unlike Wonder, which essentially exploits Auggie's disfigurement to teach us all how to be tolerant and caring, this book simply delivers that message, quietly and without fanfare, in a way that is powerful without being obnoxious. Walker never reveals Agnes's diagnosis and instead defines her by her unique interests, her personality, and her behaviors, both the usual and unusual ones. I don't keep up with many new middle grade books now that I've mostly stepped out of the library world. Knowing that I'm only going to read a few this year, I'm glad Let's Pretend We Never Met is one that happened to come across my radar. It's a book I would have loved as a kid, and one that I would absolutely feel comfortable having my own girls read in a few years. The writing is good, the characters feel real, the moral is clear but not preachy, and it is enjoyable to read.